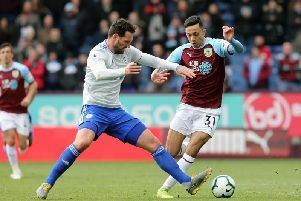 Defender Matt Lowton confessed that he’s playing the best football of his career and he owes it to the heightening competition within the Clarets squad. The 28-year-old has been part of an unchanged back four so far in the Premier League, playing all 630 minutes alongside James Tarkowski, Ben Mee and Stephen Ward. And that’s because the right back has had to step things up again in a bid to retain his place in Sean Dyche’s starting XI as the likes of Phil Bardsley continue to keep him on his toes. Asked if he’d been performing to his highest level, the former Aston Villa man said: “I definitely think so, particularly from the second half of last season. “I enjoyed it a lot and was playing my best football. I have started well this season but it’s important every weekend you give it your best. Hopefully I can keep that going. “It’s always healthy to have competition, it pushes the lads on that are playing. Equally the lads that aren’t in the team are working hard to get in so if they’re called upon, like Nick (Pope) for example, they’re ready to go. “It’s good for us as a squad and a team to have that depth. I think it’s key in any team. “It’s always good to have competition. It keeps you on your toes and playing well. “You know that if you are not up to standard there is someone as good as Phil who can come in and fill in. “It keeps you on your toes. It’s only good for the whole squad that everyone has competition for their place. “We are always on it. Every day the manager is reiterating points here and there. The Barnfield Training Centre isn’t exactly the hive of activity that it once was during the international break with many players away representing their nation’s in World Cup qualifiers. Eight players have been in action for their respective countries while injured duo Tom Heaton and Jonathan Walters would normally be on duty too. That, Lowton says, is a clear sign of how far the club has evolved. “It’s really quiet now,” he said. “There’s not many of us left. It just shows how far the club has come and the players it’s attracting. “It’s got international footballers in and I think there was eight of us last time for training. We still worked hard as you can imagine, ready to go again. “Over the last few years with the likes of Keano and Heats getting called up, and the England manager being there a few times, it obviously shows how far the club has come and the players that it’s got for him to come down and cast his eyes over.